By 2020, 50% of the U.S.’s workforce will be comprised of Millennials, or those born in the 1980s and 1990s. A quick Google search will return endless commentary and supporting data about the fickleness of this generation; namely, that they tend to be restless job-hoppers. But this actually isn’t the case at all. Turns out, Millennials are just as satisfied with their jobs as the rest of the population; the difference comes with how they prefer to conduct their job searches and their openness to new possibilities. Unlike older generations who tend to have a fear of change and prefer to hold onto comfortable job positions for as long as possible, Millennials embrace change and are open to new opportunities. In fact, even though they’re satisfied with their job, more than two-thirds of Millennials are interested in talking to a recruiter about new opportunities, and almost half have recently updated their resumes, researched job opportunities or updated their LinkedIn profile. This telling information means that while they may be satisfied today, they’re always on the lookout for the next best thing. This can be daunting to employers looking to attract younger workers, but knowing what makes Millennials tick can turn a lukewarm candidate into a loyal employee. 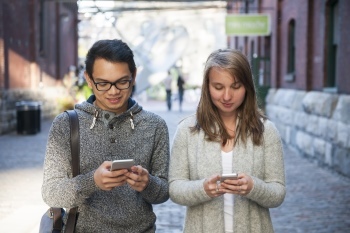 Millennials want to do their job searches quickly, in one place, and often on the go. Almost 75% search job boards for listings, while just 52% visit a company website. This means you need to have your keyword-optimized job listings front and center on all the major job boards if you want to get seen. Additionally, almost three-quarters of Millennials prefer to conduct their job searches via mobile devices versus a desktop or laptop computer. This means that you should choose job boards to list on that have high-functioning, user-friendly mobile sites. Finally, as many as 92% of Millennials prefer to hear from recruiters via email, versus 54% via phone call. This statistic solidifies the theory that many Millennials prefer digital communication to face-to-face. Why did you contact me specifically? Following an interview, 61% of Millennial candidates stated that getting all their questions answered was priority number one, versus the 52% that said the post-interview follow-up was most important. Make no mistake, Millennials are direct! Especially if you’re an established business with more traditional hiring strategies, it’s natural to feel out of place hiring Millennials. But the truth is, they are your future workforce and you need to make an effort to meet them where they are in order to establish a new generation of loyal employees. If you need help revamping your hiring strategy for Millennials, contact the professional recruiters in Milwaukee at the Lawler Group at tim@lawlergroup.com or call (262) 241-1600.